Ideally situated in the historic district of Bar Harbor, overlooking Frenchman bay, Sunset on West affords convenience and quietude in a magnificent landmark Bar Harbor Cottage built in 1910. Whether your soujourn is for romance of the adventure of Acadia, staying at Sunset on West will enhance your visit. Enjoy ocean views from well appointed rooms and suites with such amenities as fireplaces, whirlpool and clawfoot tubs, and private porches facing the sea. All of the luxurious accommodations have private baths and offer down comforters and pillows, oversized Turkish robes, evening wine and cheese and sumptuous gourmet breakfast served with warm hospitality. Sunset on West is a non-smoking inn. Kids over 16 are welcome. Sadly we cannot accept pets. We accept cash, check, Visa or Mastercard. 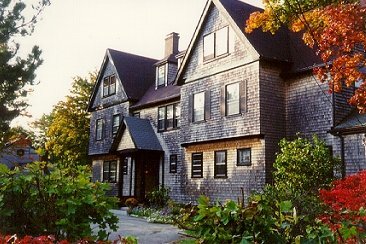 This and other Bar Harbor Bed and Breakfast Inns can be found here in The Register.